I like pizza (actually any type of bread) and Chris likes Steak and Onion. It was the perfect combination. The pizza dough was from the My Bread book. I used a sauce that I made to go with our Ash Wednesday dinner. Check back for that recipe. 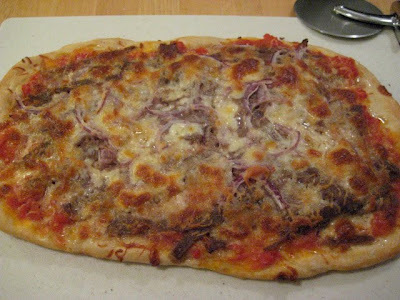 I used Steak-Ums, white and red onions, Provolone and Mozzarella cheese. It was so good. I still think putting oil on the baking sheet really gives the crust an extra crispness.